Check out Salomon Independence Run and Hike Race Team member John Stroud’s blog about the challenges of training while on a European vacation. An early summer family vacation to western Europe, or “holiday” as they say in that part of the world, provided a study in contrasting settings on the training front. The time away from work was the perfect opportunity to up my mileage and get some serious workouts in before the peak of summer race season back home. But I would soon learn that running in a new environment can be challenging. Destination 1: Germany to visit one of our past exchange students and her family in the countryside west of Cologne and Bonn. The brick house where we stayed in the small village of Walberberg once was a flour mill. It backed up against the wald, or forest, which had many dirt roads and foot trails leading to nearby towns including Brühl. My semi-regular jaunts between the more rainy days would often take me in and out of the forest onto the cobblestone streets of the village lined with quaint German homes, shops, churches and various landmarks. I quickly learned that there’s just no keeping a decent pace when running in a new and unique place, as every few blocks I would find something new to stop and check out. My runs would turn into history lessons, but the pace would quicken when I couldn’t wait to get back home to share all that I had learned. Our 10 days in Germany were also packed with many hours of touring to see the grand Cathedrals, museums and other sights in Cologne and Bonn, a cruise boat trip down the River Rhine to the village of Linz, and to an authentic medieval castle called Eltz. Destination 2: A 3-hour train trip from Cologne landed us smack dab on the busy streets of Paris, France. Gone was the quiet German countryside, and a car ride from the train station to our flat in the 6th arrondissement gave a taste of the challenges I would face running in the big city, with all its traffic, pollution and cigarette smoke. Fortunately, I would soon discover that we were just a few streets over from Luxembourg Gardens where hundreds of people can be found during any daytime hour running the circuitous paths around and through the park. We were also not far from the River Seine, where a cobblestone path followed the river front through the museum district and past the Eiffel Tower. Despite her worries about me running alone in an unfamiliar city, my wife was pleased when I would return with fresh croissants and coffee each morning. I also discovered on one particularly long run that an espresso shot midway through is just as effective as a couple of Shot Bloks. Besides the gardens and riverfront, my city runs would take me past the many statues and fountains that define the Paris streetscape, and past cemeteries that have their own unique architecture, and which seemed to beckon entry to pay some respects. 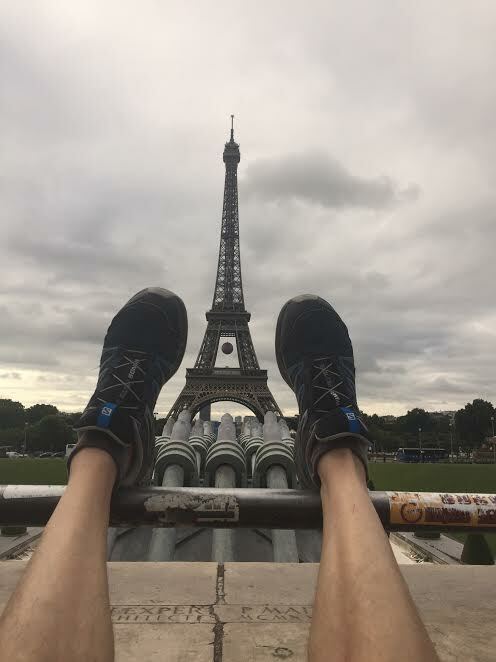 I always say a phone camera is a dangerous thing to take running, and especially in a place like Paris where one has to stop every few hundred meters for another photo opp. I have a phone full to prove it. In the end, I probably didn’t run much more or any more intently than I would have back home in Colorado, as proven by a couple of mediocre races upon return. But it did build my base after an injury-plagued season last year for what’s shaping up to be a good fall season that will include the Lead King Loop/Quarry Climb, the Aspen Golden Leaf Half Marathon, and perhaps a cross country 5K or two. As for our three weeks in Germany and Paris, oh the memories. Happy fall!